Repositioning antiquated buildings broadens the range of choices for scientists, R&D businesses and real estate developers when evaluating the type of facility required. Life science facilities are typically geared towards one of three specialties – R&D, processing, or manufacturing. Each building type can support these functions. Understanding the value of the existing core building infrastructure can inform and expedite decision making. Will the base building dovetail cost effectively into new uses for items like new duct work, gas lines, fume exhaust hoods, waste disposal? A building or campus that can seamlessly support all three specialties allows for a greater number of suitable choices that best fit the needs of the occupants. It also provides additional repositioning options for the building owner. A building’s layout allows for affordable flexing options to accommodate an R&D business’ expected vs actual growth results. Flexibility built into the design solution provides clients the opportunity to easily change the configuration within their existing footprint (scalability), or to become larger or smaller as their business requires (space size). Staying in the same building reduces risk for R&D businesses to avoid moving delicate research work, changes for scientists and researchers, and incurring move costs. Whether for a start-up incubator, clinical trial testing, or pilot manufacturing, attracting and retaining tenants requires scalability and flexibility. Evolving research methods have made it easier to design flexible buildings for diverse bioscience businesses. Shifts in type of work with less wet lab research and more dry lab work is driven by the rise in computational analysis combined with improvements in testing equipment capability and speed. The result has been a greater percentage of the square footage dedicated to dry labs rather than wet labs. The transition to robotics and desk-based workstations is a positive change for R&D businesses and building owners. Wet labs require more expensive facility infrastructure upgrades such as costly ventilation systems and gas lines, plus more space for chemicals and equipment. Brian presented a case study for a lab incubator business faced with these market forces, limited resources and growing potential. The design team’s solution transformed an old warehouse facility into a flexible workspace for scientific research. The site has two existing bow truss warehouses and a small outbuilding. 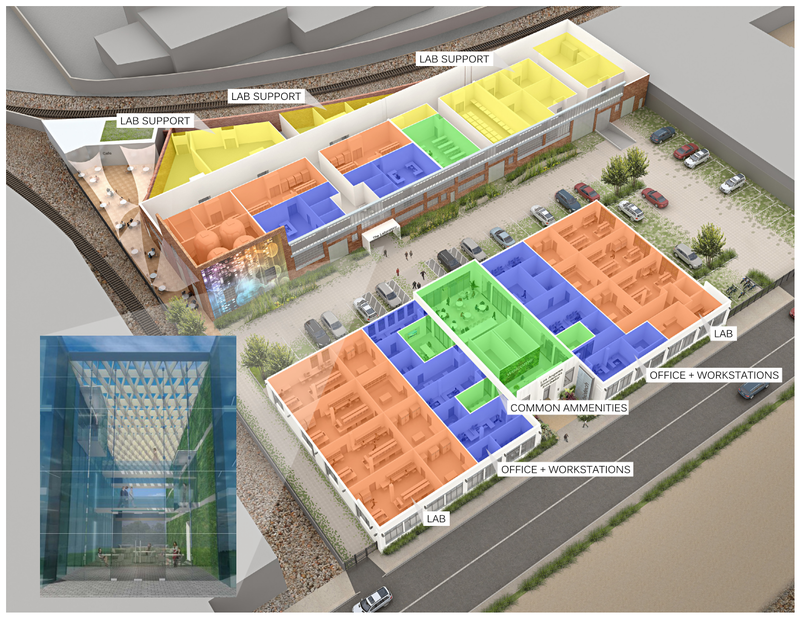 BAM’s design solution converted the industrial warehouses into a research neighborhood that contained the essentials for scientific exploration, spanning in complexity from CGMP manufacturing facilities to lab incubators and bioreactors. The new campus features amenities that are common in creative office spaces but not often found at research facilities, including a café, open collaboration areas, shared conference rooms and lush green space. To orient the occupants, minimize operations costs, and increase flexibility speed, the building is organized into 4 zones: Common Amenities, Office + Workstations, Lab and Lab Support. Common Amenities: The design proposes a skylight atrium in the back building and restoring the existing roof monitors on the front building to capture and disperse daylight throughout the facility. Office+Workstations: Fewer hard walls accommodate privacy needs compared to collaboration needs and allow for the choice between capital costs vs construction costs. Lab: The design created eight self-contained lab suites coupled with shared common areas for group research and brainstorming. The ideal size for the lab module was determined to be 11’ wide, which allows for equipment or benches on both sides of a 5’ wide aisle. The demountable partitions between the suites can be easily removed to accommodate company growth. The zone between the labs and work areas are adaptable to foster a variety of research. Lab Support: A flexible space that encourages emerging, cutting-edge scientific disciplines. Featured elements are shared laboratory support functions such as freezer farms, fermenters, sterilization and glasswash, electrical rooms and emergency generators, storage areas and manufacturing. While labs are generally windowless and isolated, BAM has found increasing natural light improves researcher morale and overall satisfaction. BAM is using these trends to design improved, state-of-the-art facilities for our life science clients. Currently, we are incorporating these insights in early design work for Agora Partners at a new property in the LA Bioscience Corridor. This entry was posted in Architecture, BAM, News, Our Work, Thought Leadership, Uncategorized and tagged Architecture, BAM, BAM Architecture Studio, Bioscience, Biosciences, LA Bioscience Hub, Life Sciences, Thought Leadership, ULI, ULI Los Angeles, Urban Land Institute, Urban Land Institute Los Angeles. Bookmark the permalink.